Best Shooting Ear Plugs Reviewed: Shoot Safely with Confidence! Proper earplug use is crucial for shooting safety. Anyone who enjoys hunting or recreational shooting should use proper hearing protection every time they fire their weapon. Although earmuffs are a great choice, there are many benefits to using ear plugs instead. 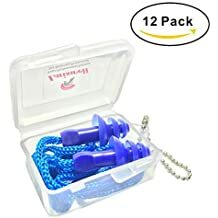 For instance, traditional foam ear plugs are available at a much cheap price, they’re disposable, and you usually get a large quality with every purchase. However, not all brands are created equal. We’re here to help you find the best shooting ear plugs available. You don’t have to worry about losing them, and if you do, just grab another pair. Besides foam, there are also more expensive shooting ear plugs on the market. These come with a lot more features and are reusable. When choosing the right protection for your needs, you should consider your price range, the features you’re interested in, and the overall quality of the product itself. As counter-intuitive as it might seem, an ear plug isn’t just an ear plug, there are major differences from one brand to another. 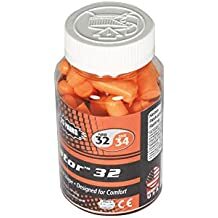 Listed below are several different types of firearm ear plugs all unique in their own way. In fact, we do our best to provide only the absolute best options available. Read on and find the options that work best for you. What Other Shooting Accessories Should You Look At? Do you have protection when hunting in snake country? Are you looking to up your gunsmithing game? Featuring a 32 noise reduction rating (NRR) rating and an extremely comfortable fit, you’ll absolutely love these Radians foam ear plugs. The tapered shape makes inserting them extremely easy while also delivering a tight yet relaxed fit. Once you insert these cordless foam plugs into your ears, you’ll forget you even have them in. Another feature that’s quite impressive is the smooth, glossy finish. This finish prevents dirt and other filth from sticking to the outer surface. There’s nothing worse than dropping your protective shooting plugs and trying to clean them off before you put them back in your ears. This dirt repelling technology will make your life a whole lot easier. Every purchase comes in an easy to carry plastic container with a total of 25 plugs. For the price, that’s a rally generous portion. Give these a try, and you’ll be glad you did. The problem with traditional ear plugs is that you have to take them out to have a conservation, and the inability to hear outer noises like honking, sirens, or even a train can be dangerous. This is why the SureFire EP4 Sonic Defenders are so unique. 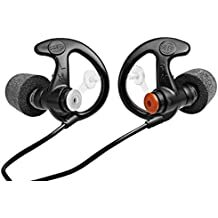 These protective hearing plugs have a 24dB noise reduction rating (NRR), and when you’re wearing them, you’ll be able to have a conversation as if you weren’t wearing any protection at all. Now, how great is that? If that’s not enough, these shooting ear plugs also have a special noise-reducing filter built into them that lowers noises 85dB and higher. 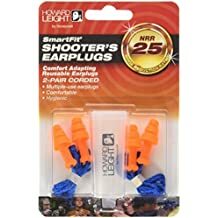 In addition to being extremely convenient, these protective firearm ear plugs by SureFire are made out of soft hypoallergenic polymer and are extremely comfortable to wear. In fact, the thin, compact, flanged design will allow you to wear a hat, a helmet, headphones, or even a ski mask without while you have the Sonic Defenders inserted in your ears. These clever little devices are even compatible with certain radio commination systems. When you purchase this innovative hearing protection, you’ll have a choice between the sizes small, medium, and large. It’s important to note that the medium fits most people. You also have a choice between the colors black, clear, and orange. Get your today and enjoy a better way of protecting your ears. 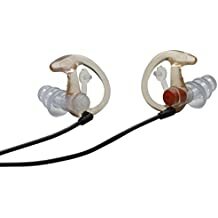 Just like with the SureFire plugs with the flanged design, these comply canal tipped plugs also give you the ability to have conversations and hear other noises when you wear them, come have a 24dB noise reduction rating (NRR), and also feature a noise-reducing filter for noises over 85dB. However, the thing that makes them different is the comply canal tips. Even though the flanged design is fantastic, these canal tips are equally great. It really just depends on what you like and what your personal preferences are. Inserting and locking these firearm ear plugs into your years is both easy and comfortable with the canal tips. The built in retention rings rest against your ears and in your ear canals at 7 different areas. This in return locks these protective shooting plugs by SureFire into place. What you get is ultimate protection and advanced comfort. The SureFire Series are definitely high-quality products for the money and are well worth the investment. They’re durable, crafted from a very tough yet soft medical-grade polymer, and made in the USA. If comfort is a high priority for you, and you prefer disposable plugs over non-disposable ones, then you’ll definitely want to give this hearing protection by Mack’s a try. You’ll be happy you did. The Comfy Cush Comfort Foam is a patented product that’s pretty much superior to other kinds of foam. These foam shooting plugs will slowly release when you squeeze and insert them into your ear canals. You’ll enjoy advanced comfort every time you use them. Mack’s are so good that they’re even the #1 choice for doctors. Comfort isn’t the only thing that makes these protective hearing plugs worth the buy. These disposable shooting plugs also have a 32 dB noise reduction rating (NRR) too. Enjoying quality ear protection doesn’t have to be expensive, and this container of disposable ear plugs is proof of that. When you purchase your own, you’ll get a total of 50 plugs for a very affordable price. 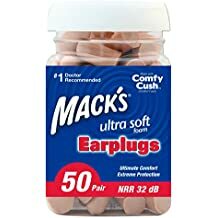 Mack’s makes all of their patented firearm ear plugs in the USA and takes pride in providing their customers with the very best in shooting protection. Although comfort and quality protection is important, so is convenience, and these Luiswell Corded Earplugs have all three of these elements. These protective hearing plugs are made out of silicone for an extremely comfortable fit. The flanged design allows you to insert them easily into your ears while also providing a tight fit for advanced protection. In addition to this, these reusable ear plugs also have a high noise reduction rating too. It doesn’t matter what kind of gun you’re shooting, your ears will be protected. Convenience is a valuable feature many companies neglect to focus on, and that’s why Luiswell stands out from the rest of the competition. Every set of plugs in this 12-pack purchase is reusable and is corded with twine. Dropping or losing your hearing protection can get quite annoying, but with this twined cord, you won’t have to worry about that anymore. When you’re done using them, they’ll hang conveniently around your neck. Every purchase comes with a convenient little carrying case. This case is lightweight, has a keychain attached for easy transportation, and keeps your protective shooting ear plugs clean free from becoming dirty. This is one great choice in shooting protection. Using your very own body heat to accommodate to the inner shape of your ear canal, these shooting ear plugs offer some of the best hearing protection on the market. The patented conforming technology utilized here provides superior comfort while also delivering a noise reduction rating (NRR) of 25. The overall design is also made to fit a wide range of different ear canal sizes and can be easily inserted with little or no effort at all. Once inserted, these shooting ear plugs by Honeywell will securely stay inside your ears until you decide to take them out. The twine cord is included to help keep you from losing or dropping your hearing protection and can be attached or detached whenever you want. Every package comes with 2-pairs and a convenient little storage case for easy travel. This case can be easily carried in your pocket, your backpack, or even in your gun case and will keep your ear protection from getting wet, dirty, or even tangled around other objects. This is one fantastic Honeywell accessory you’ll want to think about adding to your collection. Whether you are shooting or hunting, getting the right type of equipment goes above and beyond just the firearm and some ammunition. You want to make sure you’re all set to go whether you are shooting at the range or heading out to bag the first deer of the reason. While ear plugs are a necessity, make sure you have any other accessories you need, as well. Whether shooting out in the country or at a range, you want to have an array of targets available. Whether you like the traditional metal gongs often seen at competition to paper targets of all kind, having a nice variety of targets means plenty of opportunity to set up different types of training or different types of shooting experiences. Targets can vary greatly from paper to metal to different setups, and a little bit of research can go a long way to see all the options that are available. OR check out our in-depth article on recreational shooting targets. If you’re into rifle shooting, then you know there are several different positions you can fire from. Whether sitting, kneeling, standing, or prone position, there are many different ways to aim down the range and take your shot. For three of those four situations, a shooting bag can be a fantastic accessory that further aids in steadying your aim to take that all important shot. Not all shooting bags are created equal, and you’ll want to make sure to do some research so you get the one that’s right for you. With steady hands and proper ear protection, you’ll be all set to enjoy your next shooting experience. OR check out our in-depth article on shooting bag gun rests. If you find yourself hunting in wetlands, swamp, or marsh that is known to have large populations of venomous snakes then you want to make sure you have some additional protection from this natural hazard so you don’t find yourself in a potentially life threatening situation out in the middle of nowhere. There are many options when it comes to protecting yourself, but it’s hard to match what gaiters or boots bring to the table. Gaiters are another exceptional option, but many hunters who walk miles on end have commented about preferring a good pair of hunting boots so if they can get the fit, that’s the way they like to go. If you want to learn more you can go to Amazon OR check out our in-depth article on snake proof boots. Some individuals are just hunters, some just recreational shooters, and there are those shooting enthusiasts who really want to get into the tool side of firearms, and if you are more into the crafting side of things then take a look at the many gunsmithing tools that are available. From individual tools that are there for specific purposes to large kits that let you truly do a bit of everything, there are many options out there for gunsmiths, apprentices, and true beginners. You can give that some thought OR check out our in-depth article on good gunsmithing kits. While recreational shooting can be a lot of fun, and it is a great way to hone the skills before hunting season takes place. For those of us who don’t hunt as much but still enjoy the concentration, the meditation-like skills that develop from taking one shot at a time with an old bolt action, a day at the range can be a wonderful thing. However, you need the right accessories to get the most out of any shooting experience and purchasing one of the best shooting ear plugs to protect your hearing is an outstanding place to start.